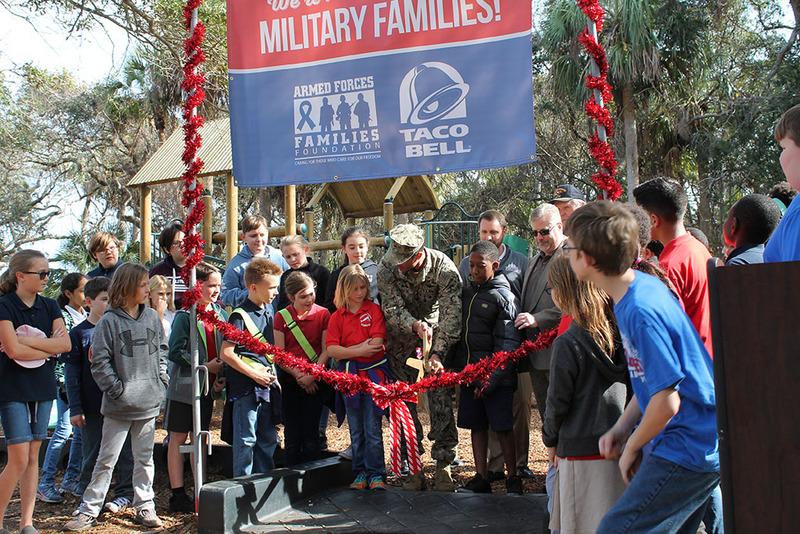 The Armed Forces Family Foundation and True Blue: Navy Family Benefactors recently cut the ribbon on a new children’s playground at Lake Wonderwood Preserve. AFFF donated a total of $40,000 towards the purchase and construction of the new playground, with True Blue covering a remaining cost of $1,440.15. The project was selected from among other pending projects due to its immediate need and benefit to Navy families who live on the Mayport Naval Base. The new playground was installed to replace an existing playground, which was torn down due to safety concerns. Since 2013, True Blue and their volunteers have worked to develop and improve the recreational facilities at Lake Wonderwood, including extending concrete pathways, building new walking bridges and continuing park upkeep. 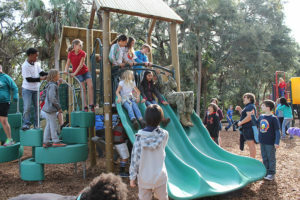 The new playground is located on the multi-use trail on the south-end of Lake Wonderwood Preserve, a 22-arce man-made lake and park located on Naval Station Mayport. The Lake Wonderwood multi-use trail is a one mile paved trail around the lake and serves as a multifaceted recreational facility that includes several pavilions, picnic areas, grill stations, children’s playgrounds and fitness stations. The trail benefits over 7,000 sailors and more than 800 families who live on Mayport Naval Base.